The highlights of my fourth day at the IOD conference in Las Vegas was the general session with Michael Lewis and Billy Beane. Billy Beane is the the general manager (as well as a minority owner) of the Oakland Athletics. Michael Lewis is the author of the book, Moneyball, that outlines how Beane revolutionized baseball analytics by focusing on different statistics than the traditional RBI and batting average. Indeed, the A's analysis showed that on-base percentage and slugging percentage were better predictors of offesnive success, and therefore translated into more wins. Additionally, because other teams were not focusing on those stats it would be easier for a small market team like the A's to acquire talent based on them and compete with the "big boys" like the New York Yankees and Boston Red Sox. Lewis and Beane were informative and entertaining. Lewis started with a funny tale about waiting to talk to the A's players and seeing them as they walked naked from the showers. He said if you just lined these guys naked, up against a wall, you'd never think they were professional athletes.When Lewis mentioned this to Beane, Beane replied that that was basically the point. He told him "We're in the market for players whose value the market doesn't grasp..."
After this conversation Lewis continued to observe the team operations for awhile. And the light bulb came on. Lewis told Beane "Aha... I see what you are doing here. You are arbitraging the mispricing of baseball players." He recognized it because he had covered Wall Street in the past. When asked if it took courage to rely on the statistics like he did, Beane countered that it really didn't. With a small market team he had no money to compete against the major market teams using traditional measurement analytics. So, it made sense to use the new statistics that were backed up by rigorous analytics and compete in a non-traditional way. Beane also discussed how baseball tends to get the 8 best teams in the playoffs each year because they play 162 games and the better teams tend to win over longer periods of time. But in the post season, with best of 5 or best of 7 series, anybody can win. The nugget of wisdom passed on by Beane in this story: "Never make decisions based on short term results." To make his point, Beane said that this year most people would agree that the Philadelphia Phillies were the best team in baseball... but they lost to the St. Louis Cardinals in a best of 5 series in the National League Division Series. The interview with Lewis and Beane tied in well to the overall theme of the IOD conference, which focused on gaining insight from information through analytics. And that is what Beane achieved and Lewis documented in Moneyball (which is now a major motion picture showing at a theatre near you). Speaking of motion pictures, not major ones by Hollywood standards but perhaps by DB2 users standards, be sure to keep checking in on the daily IOD video blog that I am hosting at http://www.softbase.com/blog. Today's video blog offers up an interview with Suresh Sane, Database Architect at DST Systems in Kansas City and three-time best user speaker at IDUG. 1 in 3 business leaders make decisions based on data they don't trust. Personally, I think the other 2 are just kidding themselves. And in a survey of IOD conference attendees, 55 percent say that the relationship between business and IT is getting better... let's hope... at some shops it couldn't get any worse, could it? At any rate, the general session kicked off and Katty Kay of BBC America was the emcee again. She did a great job at hosting today's general session (and yesterday's, too). But I have to say, the general sessions are nowhere near as entertaining as they have been at previous IOD events. Steve Mills then took the stage. For those who don't know Mr. Mills, he is Senior Vice President and Group Executive - Software and Systems. Mills provided an overview of Big Data from an IBM perspective. Mills kicked things off with a pithy quote saying "Everybody is talking about big data these days, as if data wasn't already big." True... he then went on to outline the big data challenge as the 3Vs: variety, velocity, volume. Not a bad start, but a few Vs short in my opinion... should include vicinity and validity. Mills also discussed various examples of big data solutions that IBM was working with customers on, including my personal favorite, analyzing massive volumes of "space weather" data in motion. But perhaps a more "down to Earth" example can be found in IBM helping to analyze sensor data in offshore oil rigs where more than 2 TB of data is being processed on a daily basis. Later in the day I attended a panel on customer sentiment analysis. Professor Jonathan Taplin, Director of USC's Annenberg Innovation Lab talked about analyzing social media data to measure customer sentiment around various areas including film, fashion, and even the World Series. The information uncovered helped identify movies that would tank and several film studios began working with the Lab to identify customer sentiment earlier in the cycle. After all, how does it help a movie studeo to learn that a major motion picture is about to tank on the Thursday before it opens? The studios worked with the Lab to learn about negative sentiment earlier so the studios could try to reverse the sentiment through marketing efforts. There are tremendous spinoff opportunities for this type of sentiment analysis because it gives greater insight into customer behavior. It can potentially be applied to other areas, too, such as measuring employee sentiment, or perhaps citizen sentiment to help predict and uncover events such as the Arab Spring. The key take away is to realize that this is a different type of data with low latency, real time applications. It is not the type of data that we will be storing long term in databases or data warehouses. According to Taplin, the next challenge is realtime analysis using IBM's InfoSphere Streams product. I also attended a fantastic lunch provided by IBM for IBM Champions. Thank you IBM for the nice spread and recognition. 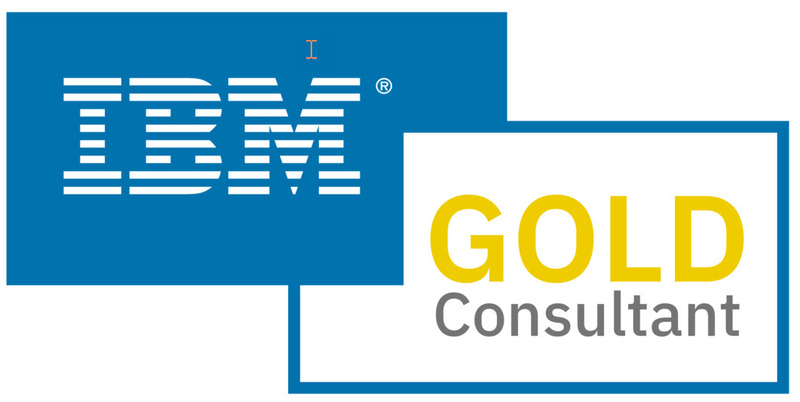 I am proud to be an IBM Champion! The conference ended with a fantastic concert from the band Train. I liked the band before this, but I really like them after the concert! Let me tell you, the lead singer Patrick Monahan has a heckuva set of pipes. The guy can flat out sing. This became abundantly clear not just in their stellar versions of thier hits (like "Meet Virginia", "Calling All Angels", and "Hey, Soul Sister") but also the fantastic cover versions (especially the "Ramble On/Walk On The Wild Side" mashup). Yes, Monahan did the vocals proud and can match Robert Plant note for note. I did not expect that. And their cover of "Dream On" was pretty good, too! Finally, don't forget to keep checking in on the video blogs I am hosting for SoftBase Systems. Today's blog interview was with advanced SQL expert, Sheryl Larsen. Check it out by clicking here! As promised, here is the second of my daily blogs from the IOD conference in Las Vegas. Today it was reported that the attendance at the event was the highest ever for an Information On Demand conference; there are more than 11,500 registered attendees. Other highlights of the day included the announcement of Cognos Mobile for the iPhone and iPad (a free trial is available on the iTune store)… and the other big product focus of the day was IBM InfoSphere BigInsights, a Hadoop-driven big data solution that can process huge amounts of data very quickly and accurately. For more details on that offering check out my Data Technology Today blog where I cover a customer implementation of this solution. I also had the opportunity to chat with IBM's Bernie Spang, Director of Marketing, Database Software and Systems. We chatted about various things, starting with the uptake of DB2 10 for z/OS. Earlier in the day it was stated that the uptake of V10 has been faster than for V9 and I asked Bernie why that was. His answer made a lot of sense: skip-level migration support coupled with a clear performance boost out-of-the-box without having to change the database or the apps. I asked if he had metrics on how many customers had migrated, but he didn't have access to that. He said he would get back to me and when he does I will share that information with you all. We also chatted quite a bit about the recently announ ced DB2 Analytics Accelator. Bernie thinks this is probably the announcement he is most excited about. For those of you who haven't heard about this great piece of technology, it is the second iteration of the Smart Analytics Optimizer (but that name is now dead). The DB2 Analytics Accelerator is built on Netezza technology and can be used to greatly improve the performance of DB2 for z/OS analytical queries without changing the SQL or any application code. There are multiple value points but Bernie pointed out the application transparency and the ability to keep the data on the z platform (no movement required) while accelerating the performance of analytical queries. Then I think I blew his mind when I passed a thought of mine past him. With Netezza being used as a component of an accelerator to improve DB2 analytical processing, has IBM given any thought to using IMS as a component of an accelerator to improve DB2's traditional OLTP processing. Not sure if that is even possible, but it should be worth a research project, right? Especially with IBM announcing IMS 12 at the conference today and the IBM boast that IMS 12 can achieve 61,000 transactions per second. That is impressive! But can the mismatch between relational and hierarchical be overcome in a useful manner to do it? Finally, we chatted about Informix. As a DB2 bigot I am always at a loss for when to direct people to Informix instead of DB2. It just doesn't sound like something I would do! But Bernie offered a brief overview of Informix time series as something unique that certain customers should look into. An Informix customer uses time series for smart meter management of over 100 million smart meters. A month's worht of data - 4 terabytes - can be loaded and processed in less than 8 hours. And some queries perform from 30x to 60x faster. OK, even to this DB2 bigot that sounds like an impressive capability. Kudos to Informix. Finally, I'd like to direct my readers over to the video blog that I am hosting in conjunction with SoftBase Systems. I'll be interviewing DB2 luminaries daily, so tune in there at http://www.softbase.com/blog to view each daily submission! Well, the first day of the IOD conference is just about behind us. As usual, Sunday is a day to get acclimated to Vegas and the Mandalay Bay conference center. If you are here, I hope you brought some comfortable shoes, because you'll be doing a LOT of walking. Typically, the highlight of the first day is the opening of the Expo Hall, and this year was no exception. The hall was jam-packed with IBM booths demonstrating and promoting all kinds of software, from DB2 to Informix to Analytics to InfoSphere to Big Data to Cloud and more. And there were also a large number of ISVs in the Expo Hall, too. It could take most of the week to visit all of the booths and learn about all the great technology on display. But, of course, we won't be doing that. Tomorrow is the beginning of the educational sessions, kicking off in the morning with the general session, which this year is titled Turning Insight Into Action. Actually, that is the theme of this year's conference, too. Word is that attendance is up this year over the 10,000 attendees at last year's conference. I haven't heard an official number yet, but I've heard rumors of more than 11,000 attendees this year. As the week progresses, I will tweet (http://www.twitter.com/craigmullins) my experiences, and blog about the conference daily. So be sure to check back here, as well as on my Twitter feed, for the straight scoop from IOD. IBM is committed to researching advanced analytics technologies as demonstrated by Watson (who is here at the conference) and IBM's $100 millions investment to develop new tools toward tackling Big Data challenges. Also, remember that I will be videotaping highlights and interviews from the conference this year in conjunction with SoftBase Systems. You can find links to these videos as the become available daily at https://www.softbase.com/blog/. Just a quick post today, Saturday, October 22nd 2011, to let everybody know that I will be blogging daily from the IOD conference in Las Vegas this week. I'll try to keep my readers up-to-date on what is going on by posting my thoughts about the conference, covering the news and announcements that are made, and by working with SoftBase Systems to produce daily videos on the news of the day along with daily interviews of DB2 luminaries... so whether you can't make the conference this year, or can but want to keep abreast of things, keep checking back here for more daily details from IOD. Let's start by letting everybody know that I will be presenting "IBM DB2 Performance Tuning Roadmap" on Tuesday, 10/25, at 2:00. I'm just one of 59 IBM Champions that will be presenting at this year's IOD conference. Here is a list if you are interested. I know a lot of my readers are waiting on the updated edition of my book, DB2 Developer's Guide. This short blog post is to let you know that the wait is almost over. The book will be published early next year and is available to be pre-ordered on amazon com. The book has been completely updated and is now up-to-date with DB2 10 for z/OS. Just think of the things that have been added to DB2 since the last time the book was updated: Universal table spaces, pureXML, SECADM, hashes, new data types, INSTEAD OF triggers, temporal support, and much, much more. Consider pre-ordering a copy today so you'll get it as soon as it comes off the presses!